Nutra Pharma Corp. (OTC:NPHC, NPHC message board) is one of the companies which will trade under the stimulation of a promotion today. The company got featured in a paid newsletter from The Stock Qizards. The letter was issued yesterday at twilight. The most important thing to pay attention to is the requisites of the coming promotion. In this regard, The Stocks Wizards have disclosed that it received 250 thousand restricted shares of NPHC common stock for a campaign that will span for three months. However, there was no mention as to who provided the money, the company itself or a third party. Last week, NPHC issued a press release as well, which may still be viable enough to add to the effect of the promotion. The company announced that it has picked up Medicines Consult to be its exclusive distributor for Jordan. The market was not moved by this news at all as NPHC stock moved within the typical price channel falling by 1.37%. The stock is currently priced at $0.071 after a slight jump of 3% in the last trading session. 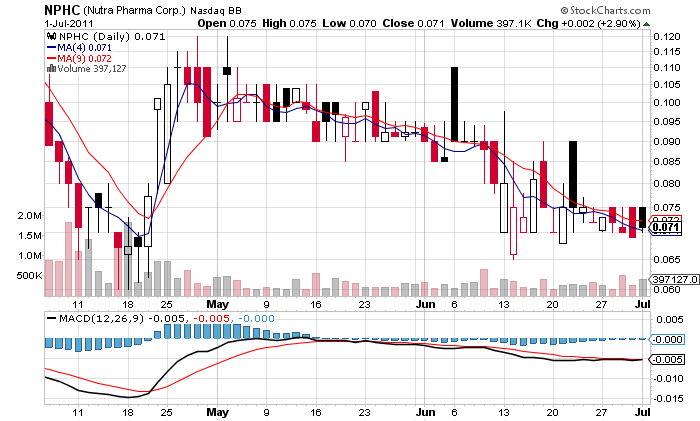 These days, NPHC has rarely seen a trading volume higher than the 90-day average. This gives some explanation of the stock promotion that will try to bring more market awareness to the company. However, the effect of the promotion is not certain at this point as there was a markedly diminishing interest in the stock since its last spike in April this year. In addition, the fact that the compensation was in the form of restricted stock means that once these shares become eligible to trade on the market, the positions of current shareholders will be damaged.